North-South divide: do Londoners benefit from more transport spending? "Londoners were scheduled at the start of this parliament to benefit from public investment of £2,731 per head compared with £5 for every citizen in the North East." Ed Miliband's speech this week on his plans to "build prosperity" outside of London has sparked a fresh examination in this morning's media of the divide between the capital and 'the regions'. Daily Telegraph columnist Mary Riddell's claim that Londoners each benefit from £2,731 of transport spending, compared to £5 for those living in the North East of England, can be traced back to 2011 research by the think-tank IPPR North. This study analysed the regional breakdown of money earmarked to be spent on projects in the future, published in the government's National Infrastructure Plan. But the analysis has been criticised by some and has since been updated by the think tank. Separate Treasury figures showing money that's already being spent also show that, while London is still out in front, the divide between the capital and the regions is less stark. IPPR North looked at the values of the projects listed in the government's infrastructure spending pipeline, and split them between the regions most likely to benefit from them. From this it determined that the total sum due to be spent on London projects was £27.3 billion, compared to £13 million set aside for projects benefiting the North East. These totals include money that was due to be contributed by the private sector. While these figures relate to plans set out in 2011, IPPR North repeated its analysis last year, and found that little had changed, attributing £2,596 of spending per head to London and £5 to the North East. The 2013 report acknowledges and responds to a number of criticisms of the 2011 research, including the Department for Transport's suggestion - referenced in the report - that the National Infrastructure Plan data is too inaccurate and volatile to draw firm conclusions between regions, as the sums spent may vary once work begins. As the House of Commons Scrutiny Unit also points out, there are some big projects missing: not all of the projects set out in the infrastructure pipeline are ascribed an area, including major projects - such as the East Coast Mainline - that could still benefit those living in the North East. To address these, we can instead look at the amount of money actually spent on transport schemes, as recorded in the Treasury's Public Expenditure Statistics, which does attempt to divide spending by the regions set to benefit. Using this data, IPPR North found that while London still enjoyed a healthy lead in terms of the amount spent on transport per head, the total came in at just under £800 each in 2010/11, while spending in the rest of the country ranged from £200 to £350 each. So the difference is less extreme on this measure. The Transport Secretary Patrick McCloughlin has also pointed out that measuring spending on transport in terms of the number of people living in each area might present a "skewed picture of the benefits of transport generally, and for transport in London particularly." This is because many of those who use public transport in London might not actually live there: Transport for London estimates that there are around 1 million trips made in London every day made by people living outside the capital, while the Transport Secretary says there are 1 million "inward commuters" to London. What do we know about regional spending? 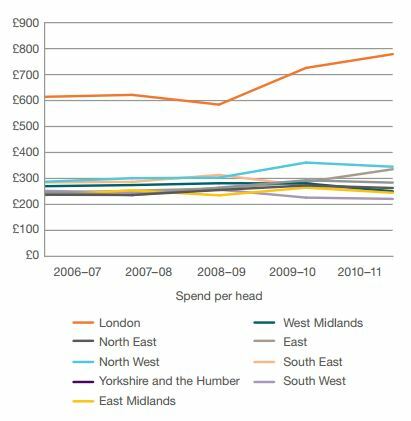 While the scale of the disparity suggested by IPPR North's research is disputed (the Scrutiny Unit advised that "the IPPR North results should be interpreted with caution"), the alternative measure of per head spending offered by the Treasury's Public Spending Statistics still suggests London receives roughly double the amount of per head spending on transport than other regions. Whether the capital receives 'disproportionate' sums of money for its transport infrastructure is another question: London's population might only be 13% of the UK total, but it accounts for half of all of the country's bus journeys while 59% of train journeys began or ended at a London terminal. Spirit of Brunel? Are we seeing a boom in transport investment?